The Backlist is available in trade paperback and ebook formats. 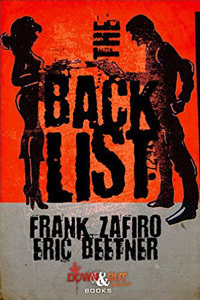 But there’s no other choice than to settle out the names on…The Backlist. ERIC BEETNER writes hardboiled crime fiction. A lot of it, with more to come. Many folks have said nice things about his books. He’s won a few awards like the 2012 Stalker award for Most Criminally Underrated author. He lives in Los Angeles where he co-hosts the Noir At The Bar reading series. To learn more visit EricBeetner.com. FRANK ZAFIRO was a police officer from 1993 to 2013. He is the author of numerous crime novels. In addition to writing, Frank is an avid hockey fan and a tortured guitarist. He lives in Chattaroy, Washington. You can keep up with him at FrankZafiro.com.